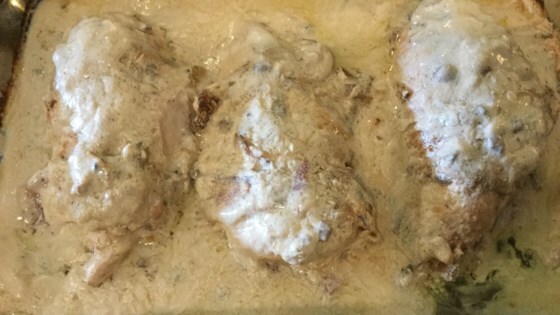 "This is a delicious and easy recipe. My kids love it. It can be made the day before and refrigerated. Good served over rice." This dish is delicious!!! The only thing I would change is cooking the bacon a little before wrapping it around the chicken. I've made this recipe for years and agree with the reviewer who cooks it at 275 for 3 hours. It is so melt-in-your-mouth tender! This was fantastic and oh, so easy. The sour cream in the soup gave it a nice tang. I made Rice-A-Riso to go with it and poured some of the soup mix over that as well...delicious!! !